Alabama’s sons and daughters of color have been among the high achievers in a wide range of endeavors throughout the state’s history. Yet, the contributions of all but a few have received scant attention in the literature. Books written about the state before the Civil Rights Movement of the 1960s carried little information about the black experience except in the context of demeaning stereotypical images. Individual success stories, when featured at all, covered only a few occupations, most frequently athletics and popular entertainment. For generations, Alabama school children studied books with little mention of Black professionals, inventors, writers, scholars, or business owners. Information was limited, in part, because of the failure of major newspapers and periodicals to cover events in the Black community. Then, too, there were few scholars of African American history on the faculties of Alabama colleges and universities. The heavy teaching and administrative schedules of faculties at small predominately black colleges left them little time to pursue research and publication. Dr. Richard Bailey fulfills a void in the literature with the publication of They Too Call Alabama Home. The widely popular television adaptation of Alex Haley’s Roots in the 1970s renewed national interest in genealogy. Studies of the South as a region and way of life abound. Blacks whose ancestors led the Great Migration from the South decades ago frequently return for family reunions and heritage tours. The State of Alabama now proudly touts its Civil War and Civil Rights legacy. Tourists come seeking documents, artifacts, and stories. 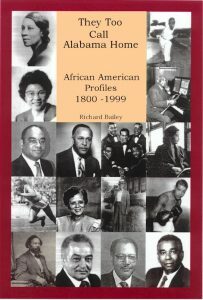 The individuals profiled in Dr. Bailey’s book are Black achievers with an Alabama connection. Some were born in the state, while others left as children and made outstanding professional contributions elsewhere. Others came to the state from around the country and became prominent lifelong residents. However, most of the individuals profiled in They Too Called Alabama Home were born and bred in Alabama and were shaped by its customs, culture, and institutions. Dr. Bailey’s achievers are a diverse group. They cut across political, religious, and class lines. He disperses millionaires among persons of modest means. Bailey includes people with household names with persons of little recognition outside their communities. A few of them made their mark early in the state’s history. Others are recent achievers. Some broke racial barriers and became the first Blacks in their chosen endeavors. Others left the state because of impediments to professional growth, while still others remained and changed the social and political environment of the state. Dr. Bailey’s intent is not to offer a sociological treatise on race and society in Alabama, although insights on the society are discernible through the experiences of the achievers. His approach is that of the historian who embraces the craft of the biographer. Dr. Bailey’s subjects demonstrate traits of perseverance, patience, and self-confidence in the midst of countless obstacles. The lives of more than 375 individuals are depicted in They Too Call Alabama Home. Future writers can build on the work begun in this very valuable work. There are many more Alabamians who have excelled but whose achievements have yet to be celebrated widely. This volume should appeal to persons interested in history, biography, and popular cultures. Readers who were introduced to Dr. Bailey’s work through his highly regarded Neither Carpetbaggers Nor Scalawags, published in 1991, will find this volume a valuable companion.